A developer has closed the popular Hastain Trail and intends to build homes adjacent to Franklin Canyon, a National Park Service preserve located above Beverly Hills in the Santa Monica Mountains National Recreation Area. 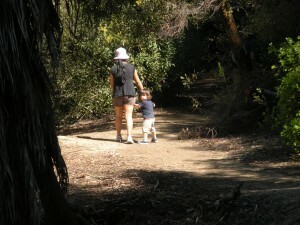 When you think of National Parkland, you think it’s immune from the pressures of development. In Franklin Canyon, part of the Santa Monica Mountains National Recreation Area, a developer has fenced-off a popular trail and is intending to build homes on his acreage above Beverly Hills. I found out about the trail obstruction recently when I attempted to hike Hastain Trail, an old favorite that loops 2.3 miles amidst oaks and sycamores and across chaparral-cloaked hillsides. It’s a great path to work off that urban angst and get great vistas of L.A.’s busy Wilshire corridor and the sprawling San Fernando Valley. 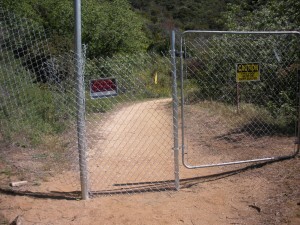 A half-mile or so from the trailhead, I came to a shiny new fence blocking my way. That’s when I started asking questions. It seems real estate developer Mohamed Hadid, who has designed and built more than a dozen Ritz-Carlton hotels plus many Beverly Hills mansions, owns 97 acres right next to Franklin Canyon Park. The park’s Hastain Trail crosses his property. Much to the fury of conservationists, and of hikers who have roamed these hills since the 1960s, Hadid now wants to build on his land and has closed the trail. “I understand they believe the land belongs to them because they have been hiking here and there for years…. But it’s private land,” Hadid said when interviewed for an article for the Los Angeles Times. The Times reported that when Hadid began preliminary grading, Ellen Scott tried to stop a bulldozer by sitting in front of it. 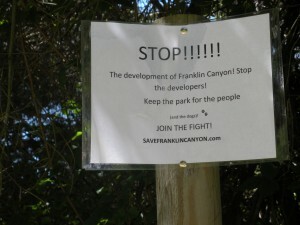 Scott agreed to leave when Hadid politely ordered her off his land but she soon founded a grassroots campaign called Save Franklin Canyon. Supporters are many and an attorney is helping the conservation group prepare a lawsuit in order to get a public easement for the trail. The case is likely to center around the rule of “implied dedication,” that can provide the public rights over private land if it is proved that Hastain Trail has been in public use for a very long time. The controversy has the attention of conservationists all over Los Angeles, as well as the leading conservation group in the region, the Mountains Conservation and Recreation Authority. I wonder: how many more times hikers and developers will have to fight it out in the media and in the courtroom over trail access and the rights of passage? Frankly, Franklin Canyon is just the latest in a long list of battles over trails. Native Angeleno that I am, I can recall similar trail controversies in Palos Verdes, the San Gabriel Mountains, Puente Hills, Malibu, Baldwin Hills…well, just about everywhere in L.A. County where there are hikers, trails and developers. If you’re a hiker who trekked Franklin Canyon in the years before 1972, Save Franklin Canyon wants to hear from you. Your recollections of hiking the wilds of Beverly Hills could prove invaluable in establishing longtime public use and thus saving Hastain Trail for generations to come.